Commands mod for MCPE 0.10.5 (iOS)More and more mods for ios , now the owners of the apple using the application Description can enter commands in the chat. Freeze camera mod for MCPE 0.10.5The mod adds useful commands - the view from 3 persons, zoom, squats and subject - the camera. HACK ON cheate for Minecraft PE 0.10.4This cheat in the game to add five additional functions very steep. Using these functions, you can switch the time of day in the game, get immortality, will be able to quickly change the game modes. 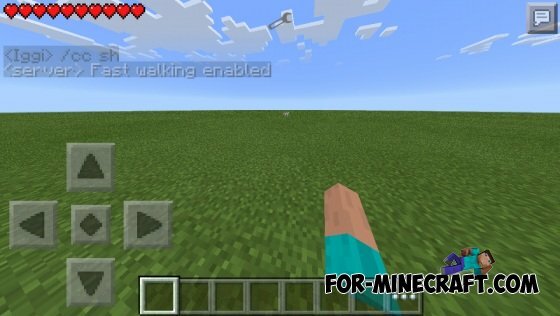 Worldedit for Minecraft PE 0.9.5This mod adds the ability to edit your world with a wooden ax and commands in chat.